← Handlebar Bags: Which Size for Your Bike? 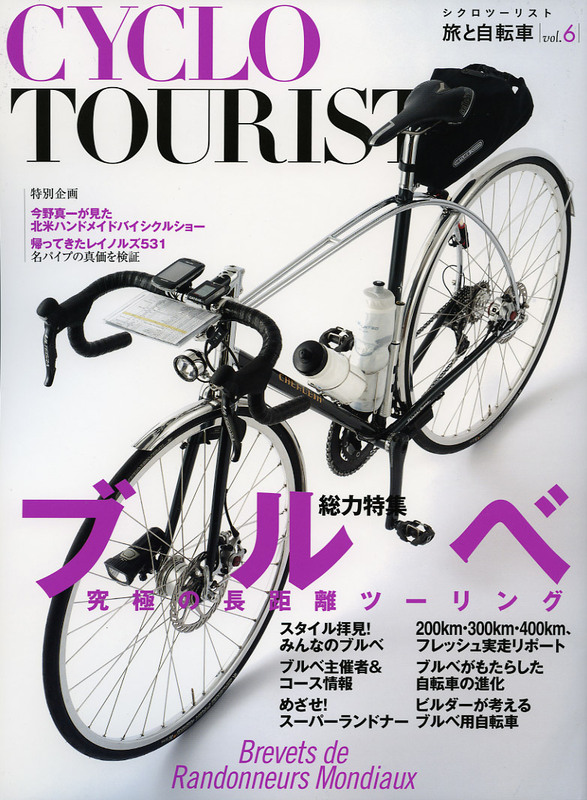 Yesterday’s mail brought a nice surprise: the May issue of the Japanese magazine Cyclotourist, with an article I wrote about the history of randonneuring and of randonneur bicycles in France. Unfortunately, I don’t read Japanese, but from what I can tell, they did a very nice job with the 6-page article. My article provides an overview of randonneuring and the many events associated with the sport, like Paris-Brest-Paris and the Polymultipliée de Chanteloup hillclimb race. I always enjoy writing for other publications, as it provides an opportunity to introduce our research to new audiences. 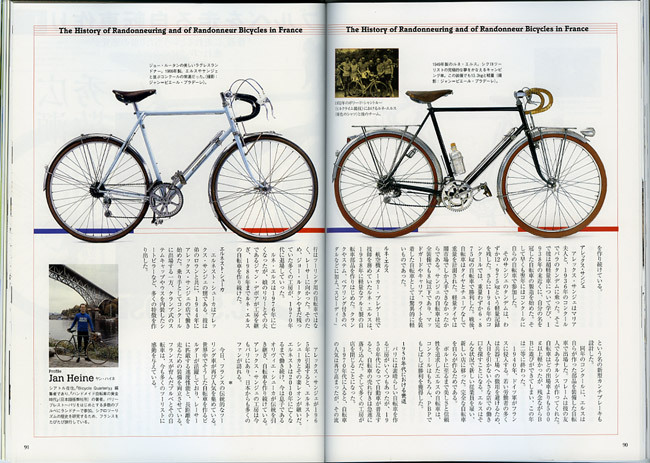 Bicycle Quarterly has many readers in Japan, but this article, which was translated into Japanese, overcomes the language barrier and provides a historical background for the bicycles that the Japanese admire so much. I hope you can do a review of the bike on the cover. That’s a modern randonneuse. It is exciting to see thoughtful builders exploring the things that new technology can enable. I expect someday we will see you do a write-up on a disk brake bike that you love. I believe your concern about needing an overly stiff fork to handle a front disk brake is valid, but I also believe that a clever designer who shares your values will solve that. Check Cherubim’s customs page for more pictures and some details. Wow, really fascinating bikes on the Cherubim page. I think there is a way to deal with the problem of using overly stiff fork blades with disc brakes. I’ve seen it done with drum brakes on bicycles before, but a more readily available illustration is to look at the rear disc brakes of motorcycles. The main goal is to remove the braking forces from the fork blades and placing them between the axle point and the top of the fork blade, near the strength of the lug. The caliper needs to be mounted on the axle, in such a manner that it can pivot. The caliper should be to the front of the fork blade, at about a 10:00 position on the rotor. At the front of the caliper should be a rod that connects to the very top of the fork blade, if not the lug. This rod should have bushings so that it, with the caliper, can pivot when the fork blade flexes. This rod also transfers the force of the caliper to a stiff part of the fork, instead of inappropriately to a part (fork blade) that needs to be flexible. If you look at how most front drum brakes are mounted on bicycles, you will see these concepts. One compromise is that the “braking arms” usually only go part way up the fork blades. I have seen pictures where the bicyclist has fabricated a longer arm that attaches at the top of the fork. Bear in mind, though, that unless there is a dedicated pivot, such an arm would serve to stiffen fork blade flexibility. Of course this is a bit of a theory, but I’d love to see if it would actually work! p.s. I drew pictures, but didn’t know how to upload those here. Interesting observation even though on the rear of a motorcycle the caliper is axle mounted primarily to allow it to move with the axle while the chain is adjusted. More modern iterations use a caliper bracket with a sliding tongue and groove arrangement that allows the axle to more fore and aft without rotation. Regardless of how it’s done there will still be stresses that differ with a fork mounted brake caliper. While your suggestion may have some application in changing the braking force vector I don’t believe it would be the ultimate solution you are hoping it to be. Is your article to be published in English at some point? I would be interested in reading it. A more detailed history of randonneuring has been published in several installments in Bicycle Quarterly. For the history of French randonneur bikes, I recommend The Golden Age of Handbuilt Bicycles. Could you tell use what brand of bike is on the cover? I can’t make out the name on the downtube. I would check with Jitensha Studio in Berkeley, they might have a copy or two. Otherwise, it might be hard to find here. It should also be mentioned that you contributed an excellent, basic article on the function of brakes to Adventure Cycling. You included cross-sections of worn rims, good photos of brake pad/rim contact, which are things usually neglected in maintainance articles. Writing the “Mechanical Advantage” column for Adventure Cycling has been fun. Sheldon Brown used to write it, so those are big shoes to fill. It’s another opportunity to bring our ideas to a wider audience. R.J., Please don’t think of my response as any “ultimate solution.” Quite frankly, I think disc brake setups are an engineering step backwards. The rim brake still retains far more engineering potential than the extra parts a disc or even drum brake entail. Integrating several functions into a single part (the rim) results in an elegant solution. My only complaint about rim brakes is when it rains and the shoes dissolve into nothingness. That was when I used black shoes, but the salmon kool-stops are quite resilient. Would a further development in brake shoe materials bring rim brakes back into direct competition with disc brakes? My idea is nothing new. It was used with drum brakes. But it will never pass in this market because no one except readers of this list care to appreciate flexible fork blades. The rest of the world readily accepts overly stiff uni-blades or energy-sucking dampened telescopic forks. My idea was simply to re-vector braking forces in order to preserve the function of flexible fork blades. Can you be more specific in which aspects might not work? thx!